Home > Practice Jewel / Massage manEdger > Communication and E-mail > Using the Email Editor? To make it easy to send more sophisticated email messages, the system's email tool uses the same content editor as the one used in the My Pages area, so you can use many of our content editor tutorials to spice up your images. Images, document links and links to website pages can be added to your email messages. Creating Tables for your Website! How to Upload and Link to a Document! 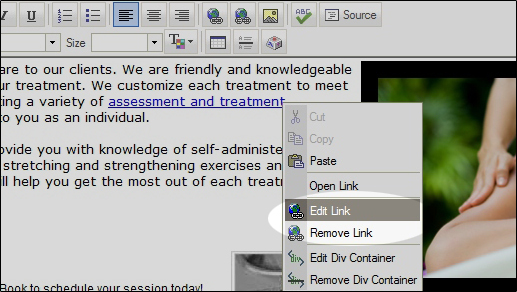 How to Edit or Remove links from your website! For more general information about the email function in Massage manEdger click How to send e-mail messages using Massage manEdger! or How to save email messages!